We’ve all woken up on the wrong side of the bed. But have you ever woken up stuck to the bed? Masha Sweet has. And there’s only one possible reason: her little sister Sunny. Masha is used to Sunny’s evil genius ways, but the glue Sunny used to secure a bouquet of plastic daisies to Masha’s head is not coming out! The girls have to stay home from school and through a bizarre turn of events, they wind up at the hospital. It’s the perfect place to fix Masha’s head…but first they will (almost) contract a (not so) killer virus, steal a cast, and lead the nurses on a wild goose chase. When this is all over, Sunny Sweet is going to be so sorry! 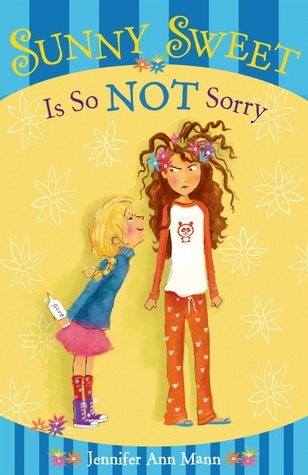 Jennifer Mann’s debut middle grade novel is a fun introduction to Masha Sweet and her sister, Sunny. Sunny is a child genius, much to the horror of her older sister, Masha. Masha is usually the victim of Sunny’s experiments, which Sunny always seems to get away with. This time, Sunny has gone too far by using a super-strength glue to affix flowers into Masha’s hair. A hilarious series of events follows. Masha has a unique voice for a middle schooler, and one that makes the reader feel both her love and disdain for her little sister. Middle school readers will likely enjoy the crazy adventure the sisters go on at the hospital, although as an adult I found myself wondering about how realistic certain events really were. This was a quick read, and I think most pre-teen girls would love it. There was also a little bit of age-appropriate romance, and this issues of divorce and fitting in with peers were touched on. This should be a fun series to follow in the coming years. I love MG stories. They have such great imagination! This one sounds really good.